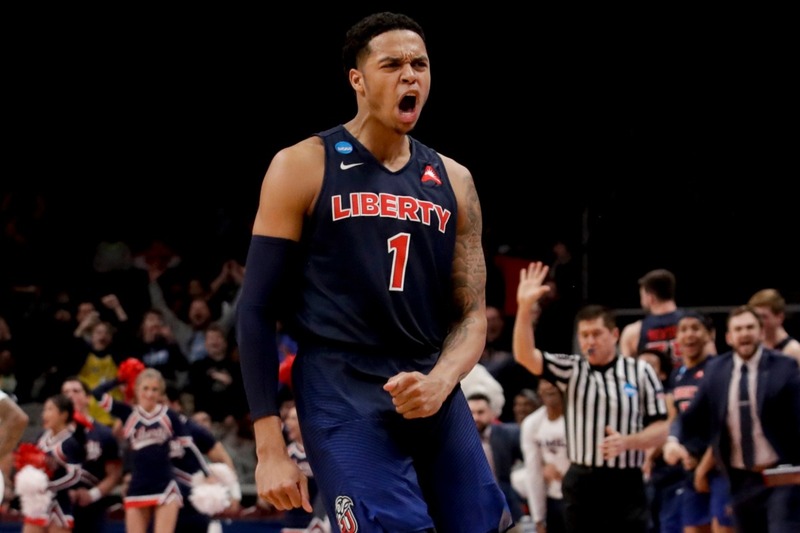 Coming back from a 10-point second-half deficit, Liberty rode the hot hand of Caleb Homesley to secure an 80-76 victory over Mississippi State on Friday, the first NCAA Tournament victory in the school’s history. And it marked the third win this year by a No. 12 seed over a No. 5 (Oregon and Murray State also won as 12-seeds). Homesley, a redshirt junior, scored a career-high 30 points on the night, 22 of which came in the second half. The Flames were down 10 with less than seven minutes remaining, but Homesley dropped in 14 points in a span of less than five minutes, and Lovell Cabbil hit a go-ahead 3-pointer with 1:16 to play. Immediately after the game, Liberty head coach Ritchie McKay gave credit to God. The high-scoring night for Homesley continues what has been an incredible season. Earlier in the year he became the 27th player in Liberty history to surpass 1,000 career points. That’s quite a feat considering he has had to endure two reconstructive knee surgeries. The win means Liberty will remain in San Jose, Calif., for a second-round matchup against fourth-seeded Virginia Tech on Sunday. In three previous trips to the NCAA Tournament, the Flames lost twice as a No. 16 seed and once in a play-in game. Founded by the late pastor Jerry Falwell Sr., Liberty University is located in Lynchburg, Va., and is one of the largest Christian universities in the world. The Christ-centered culture on campus is what attracts many of its students — and its coaches.